My house sits at a bend in the canal on our farm. The front of the house looks directly at the shop, as if, among the abundance of natural beauty surround the house, the shop is the best thing to look at. Clearly this home was built by a different kind of farmer (it was built by Johnny, our childhood neighbor in the 70’s who was less than excited about his new hippie neighbors). The side door on this house is the one with the views. For this reason it is our side yard that received all the attention when we started the landscaping. From the side yard the view goes north, over the canal, across the lower fields and up the rolling hills, scattered with oaks, until the horizon meets the sky. This spot on the farm is interesting because it is centrally located, but the canal doesn’t have a bridge over it, making the fields on the other side extremely difficult to reach. Hours and hours, miles over miles, have been spent by tractors and farm vehicles driving up the canal to the nearest bridge, then back down it. North from my side yard, just across the canal, is a huge oak tree. This time of the year the oak leaves have grown to their full size but they are light green in color, awaiting the summer heat to darken them up. At the top of this oak tree, in the crux of some branches, a pair of red tailed hawks have put their nest. This is the third season in a row the couple has chosen this spot to raise their little babies. Below the oak tree with the hawk nest, the construction on the much needed bridge across the canal has just been finished. Last week after my day had ended I sat in our swinging bench with my wife, beverages in hand, while the kids watered their garden. The smell of spring rolled through the yard with the breeze. The hawks came and went from their nest in the tree and below them a tractor returning from the field was able to use the bridge to get back to the shop - saving the first ten minutes in travel time. The tractor driver and I exchanged thumbs ups over the new bridge. As a small organic farm, we grow a lot of carrots — so that means that our small family also eats a lot of carrots! While it's hard to beat the sweet and earthy flavor of our Nantes carrots enjoyed raw, it's a fun treat to turn a few into savory chip sticks. Now, it may come as a surprise how quickly little ones can make an entire baking sheet of freshly roasted carrot chips disappear before their parents can get one — so, you might want to plan on more than one batch if you have sneaky wee folks around. Tip: Using a Y-shaped peeler (instead of a mandolin or regular peeler) makes it a little easier to consistently shave off longer, more uniformly thick carrot ribbons. Although this recipe works with any size carrot, it's best to choose the larger of the carrots in your bunch. Try to choose similarly sized carrots so that the carrot ribbons are fairly uniform in size. Simply give the carrots a gentle scrub under water; there's no need to pre-peel. 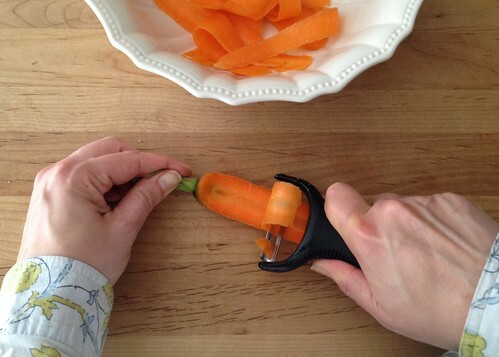 Holding the carrot by the stem, shave off a long thin ribbon of carrot using a vegetable peeler. Try to get the peels as uniform as possible and feel free to snack on any pieces that are too small or too thin to use. 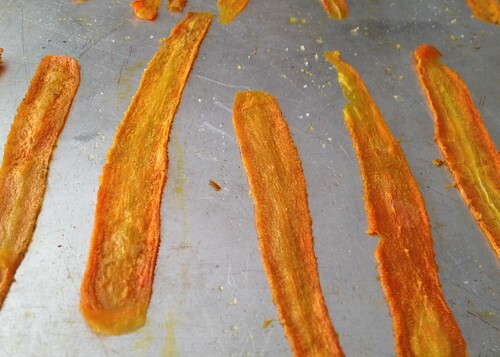 Place carrot strips in a large bowl. Gently toss with olive oil, taking care to not break the strips. Start with a teaspoon of oil and increase if needed. Place the carrots on a lightly-oiled baking sheet in a single layer. While the edges can slightly touch, they should not overlap. Tip: Don't use parchment paper for chips as they don't quite get that crisp. Before placing in the oven, season with freshly-ground pepper and your favorite salt or seasonings. While we tend to keep it simple with salt and pepper, chopping fresh herbs like thyme and rosemary into a little salt is also nice. Some folks like to add a little heat with a sprinkle of curry powder or red pepper flakes. Bake for 6 minutes before swapping your baking pans from the top to bottom racks. Bake an additional 6-8 minutes until the carrot edges barely start to turn a golden brown. While toasty edges can be delicious, the thin, delicate carrot ribbons can quickly turn from just-right to burnt, so don't stray too far from the oven in the final minutes. Leave the baking sheets in the oven, turn off the heat and leave the oven door ajar for about 2 minutes. Tip: If you are going to make a second batch and aren't ready to turn off the oven, simply jump to the next step and crisp your carrots by leaving on the counter. 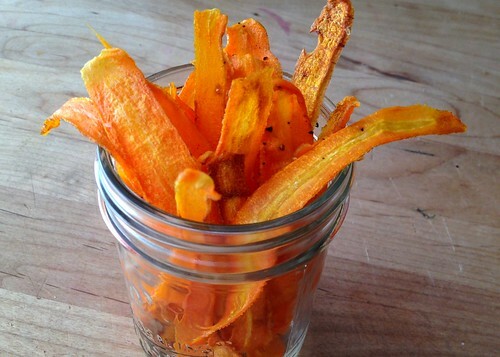 To finish crisping the carrot chips, remove from the oven and place on the counter/wire rack to cool. Carefully remove from the baking sheet and enjoy! 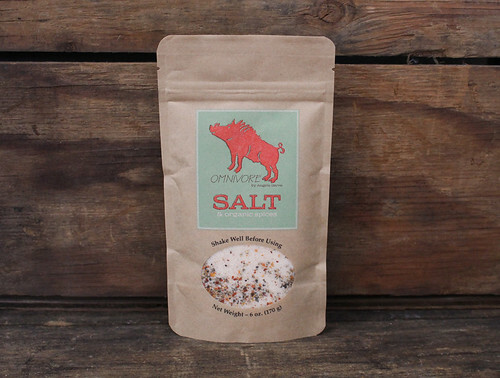 We wouldn’t normally shout the praise of seasonings from the rooftop, however, Omnivore Salt is a special mix of salt, wild fennel, a little hot pepper and a blend of secret spices that come with some high-hitting recommendations from some of California’s most influential foodies. We couldn’t help but share the food love. Hope you enjoy! "Angelo Garro has been one of my most influential teachers, in the kitchen as well as in the fields and woods. 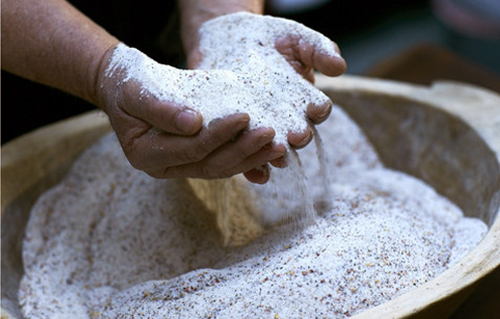 A few years ago, he began bringing bags of his Omnivore Salt whenever he came to dinner. I have no idea what's in it, but I can tell you that Omnivore Salt improves whatever it touches. I use it to season meat a day or two before cooking, in salad dressing, on eggs - on just about anything savory in fact. As a rule I don't do product endorsements, but my debt to Angelo is so deep, and his salt is so special, that I have no choice. Rule broken." "Congratulations Angelo! Finally your salt is in the market and I do not need to steal from your kitchen anymore."